Recorded in the Gramzapis Studio, St. Petersburg, 1982. 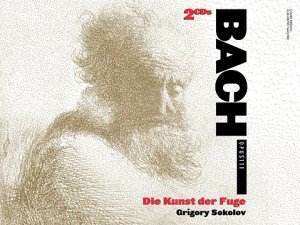 Here we have a double album of some superb playing of Bach on the piano, rather than a harpsichord, or worse still, one of those reconstructed instruments which sound neither one thing nor the other. Grigory Sokolov, having recorded for Opus 111 for some time, here delights the ear with some very sensitive piano playing. There is moreover, enough variation of tempo and articulation to make this work seem much shorter than it really is - this is the sign of a master pianist. The Partita No. 2 is played in the same way, and I enjoyed this disc very much. The only quirk I was able to discern in his playing was a tendency to spread some chords very widely, which I thought was a slight mannerism. This is particularly evident with the opening of the Partita, which whilst other soloists do the same thing, the extent is much less. This did not mar my enjoyment of this issue. Is there anything to complain about? Well, yes. The recording, made in Russia in 1982, was an early digital recording, and the piano sound is a little metallic with a "digital glare" on it. This is not particularly serious, but competition is severe, and when you compare this issue with those available from Hyperion (Tatiana Nikolaieva) and Philips (Zoltan Kocsis), the difference is clearly audible. Grigory Sokolov is a native of Saint Petersburg, born there in 1950. He studied in St. Petersburg, and at the age of 16, won the Tchaikovsky Competition, that year judged by among others, Emil Gilels. The verdict was unanimous. His playing is characterised by great intensity and precision, with Sokolov displaying great variety in his playing. This is heard to the full in these performances, and I look forward to hearing from him again. There is relatively little of his playing in the catalogue, although in the seven or so recordings available, the range of composers is quite large, and I certainly want to hear more. Playing time could have been a little more generous on this set, as there is another 40 minutes or so available. Maybe OPUS did not have any more material to add which would not have seemed out of place sharing the discs with J.S. Bach.